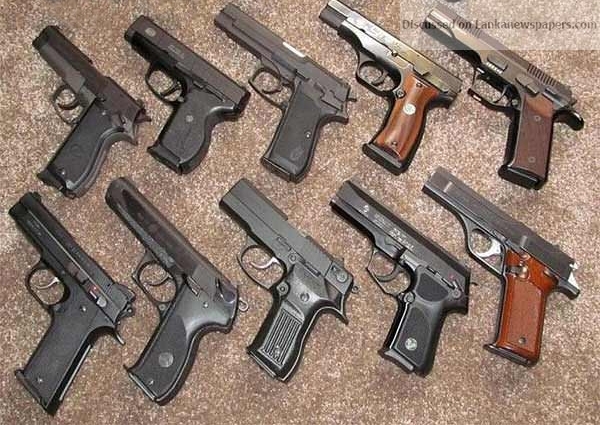 Defence Secretary Hemasiri Fernando today said licences of all 9mm firearms had been suspended and new licences would be issued from January 23. Mr. Fernando expressed these views at a ceremony held in Nalanda College, Colombo today. The Secretary was felicitated by the President of the Ranaviru Association of the Nalanda College OBA, Commander of the Air Force, Air Marshal Kapila Jayampathy and school officials upon his arrival at the school, the Defence Ministry said in a statement. Subsequently, the Secretary visited the War Hero monument at the school and made floral tribute. Later, he was also accorded a Guard of Honour by the school’s Cadet Platoon. A large number of old Nalandian tri-forces and police personnel, both serving and retired attended the felicitation ceremony held in order to honour Mr. Fernando.